Smartphone cameras have come on in leaps and bounds in recent years, and are now quite often the main device that many people use. Now the Nokia Lumia 1520 camera beats the competition in some blind tests. Nokia has long been associated with providing mobile users quality cameras, and now a blind test conducted by Phone Arena has found that readers prefer the images provided by the Nokia Lumia 1520. Out of the total votes the handset achieved 17.9% beating the LG G2 into second place with 13.95%, while the top 3 was rounded off by the Sony Xperia Z1 Compact on 12.91%. 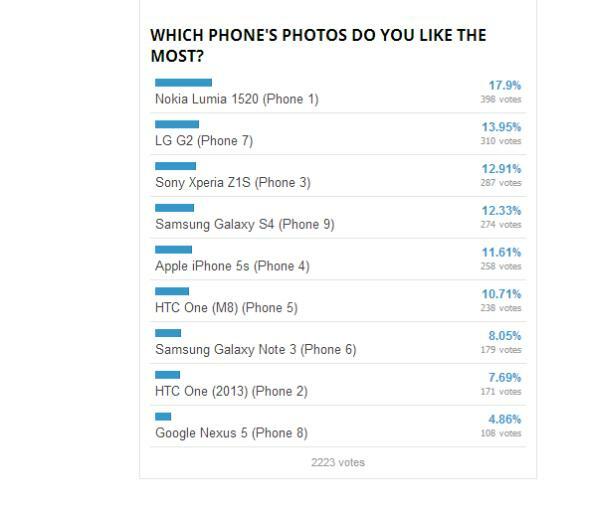 The likes of the Galaxy S4 and iPhone 5S came 4th and 5th respectively, while the recently released HTC One M8 came 6th with 10.71% of the vote. Bringing up the rear was the Nexus 5 with the camera on the device long thought to be the weak link of the handset. A similar test run a few months ago by the same website then found the iPhone 5S to be the favourite in terms of camera results, and you may be interested in an earlier post that compared some of these handsets in low light image taking. Are you happy with your smartphones camera? Everyone I showed pictures taken from my 1520 was wowed by the image quality. Though most are have little to no knowledge of WP and its capabilities and there just pass it on. They plainly stick to what’s popular. Sad. Same here lubba, everyone who I have shown my 1020 to are in absolute awe at the picture quality.